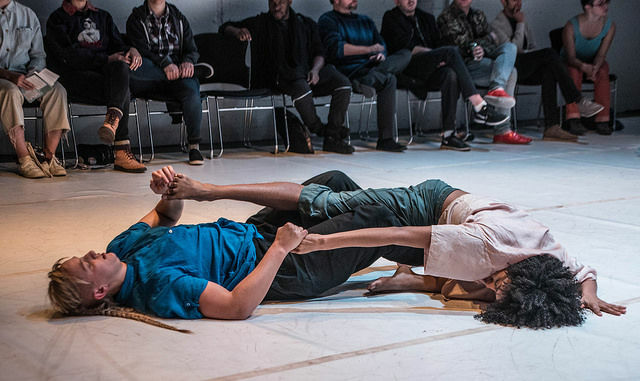 The Performing Diaspora residency at CounterPulse returned this year with two works mapping the connection between ancestry, queer identity, and tradition asking, ‘How do we collaborate with the force of the unseen? How we can transcend the toxins flowing in our bodies and societies?’ The residency creates a platform for artists of color to tell their own stories across time, without boundaries or borders. This years artists included Mother the Verb, a collective of three femmes, Javier Stell-Fresquez, Davia Spain, and Ivy Monteiro, who dug into themes of toxicity, compulsory care, and motherhood. Alongside Mother the Verb, artist Randy Reyes premiered a new work titled Lxs Desaparecidxs, featuring Jose Abad, Emelia Martinez-Brumbaugh, Stephanie Hewett, Felix (Sol) Linck Frenz, and Gabriel Christian. Lxs Desaparecidxs, explores ritual and ancestral embodiment, and by highlighting those who’ve come before us, the invisibilized, erased, and disappeared, the work honors the past and carries it into the present. Both works use tradition and ancestry to challenge current social systems and ideologies that ignore marginalized hxstories, collective practices, and identities. Together Performing Diaspora residents build on their legacies as pained and compromised maps towards a future of greater healing and connectivity. Mother the Verb began with Ivy Monteiro pumping artificial fluids from her breasts into a pesticide container, transmitting her toxins, her trauma and nutrients, to future generations. The interactive installations precluding the dance were followed by a poetic monologue recounting exposure to pesticides experienced in the Rio Grande Valley. Consuming symbolic pesticides on stage, Ivy and Javier Stell-Fresquez breezed between the audience with a pesticide spritzer flowing. Suspended mist reached across the distance between spectator and the lived experience of farm workers. The re-enactment made their experiences with poison physical and fathomable, and grounded us in the quotidian health consequences of late capitalism. 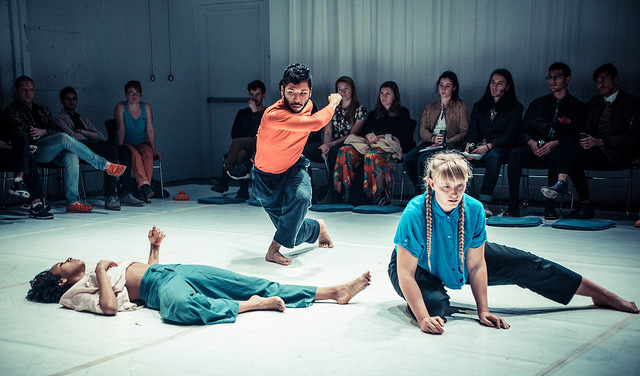 In many ways the performance was tactile, engaging the audience with the physicality of the space. We sat circled wide around the performers, all intentionally connected and in sight of each other. The atmosphere was activated when Ivy, sitting on a toxic barrel, birthed an enormous sheet of plastic that billowed above the audiences with the movement of the performers. The synthetic plastic cascaded organically in the air, consuming the artists’ bodies and enclosing us all in a giant womb, as a lively Brazilian techno beat gestured at the exoticized body. Migration trails of plastics and pollution in the air revealed the desire for safety, stability, and familia. Lifetimes of exodus and exploitation are embedded into the physical body and environment, birthing the immediate necessity for mothers, caretakers, and loved others to heal. 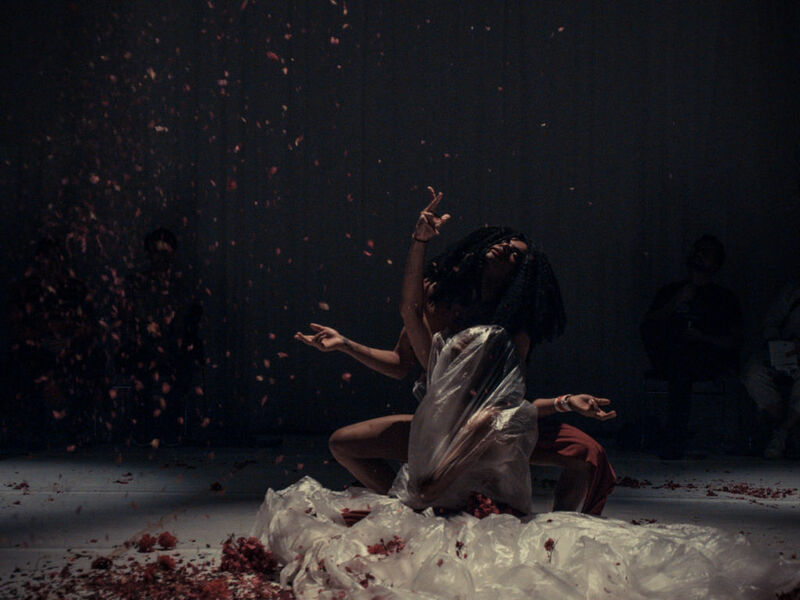 From this point the performance shifted into a solemn video of Davia Spain projected across the stage in a moment of stillness between Ivy and Javier. Her face was obscured by a plastic veil, alive with motion, as she placed an invisible crown on her head. Davia became a saintly and eerie presence overlooking the audience from another queendom. Practically unseen as both a performer who remained removed from the stage, and as a video subject veiled in plastic, Davia made a powerful allusion to her invisibility and experience as a trans woman. As Ivy and Javier danced on stage they became the embodiment of motherhood. Unified by yards of red fabric wrapped around their bare forms, they continuously unraveled and reunited creating a landscape of interconnected, interdependent beings. Sometimes lovingly, sometimes out of necessity, they carried each other across the stage. Together they are held, loved, and surviving. Allusions to the by-products of capitalism like exposure to toxic environments and individualist driven isolation, grate against movements of loving codependence. Their bodies formed portrayals of a mother-sister-femmehood that can blossom through concrete and chain link border fences. 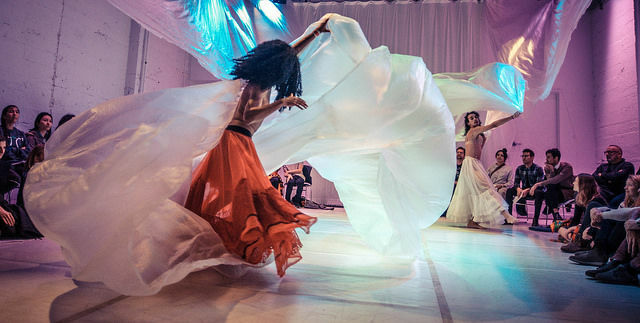 Like true goddesses, these femmes broke stereotypes by unabashedly celebrating and elevating femininity, queer love, and chosen family in a visually stunning multi-media performance. The dance concluded with purple and pink bougainvillea petals falling gently on Javier and Ivy in a breathtaking and necessary vision of the glorification of motherhood. Collapsing on the floor Lxs Desaparecidxs could be heard as thuds on the ground. Physically exhausting movements of repetition built a vocabulary of ritual dance. Often moving singularly, the dancers became a scene of internal struggle and introspection, engaging with unseen and unheard manifestations, the theater became a space of spirit and strife. “Can the stage floor of an old Tenderloin pornographic cinema hide bones? We are the dogs or the shovels. We are the sniff-outs, dig-outs, pull-ups, dust-offs. Every step could be considered radar. The dancers intently moving in separate spheres, at times came together, sharing visions and space before departing into a different time and place. Their movements felt spontaneous, and filled with the unknown. The invisible became just as pertinent as what was seen. Who was in the space with us, what happened on this land, who came before? Each actor engaged with the unnamed around us, fluctuating between training, building tension in their bodies, and resting from the endeavor. Together we witnessed the setting of intention, the connecting of past with future, and the strenuous labor diasporic artists take on to keep and evolve tradition. Quietly, bodies came together physically grounding into each other and the floor in a tense intimacy. Holding each other’s gaze and bodies, and fluctuating between gentle and firm, the dancers gripped each other. When abruptly club music with strobe lights flashed, the space was cleansed and shook with reverberating energy. The group synchronized into a familiar queer ritual, a dance party. The performance came full circle when the final moments of the piece were spent where it began, together at an altar the dancers circled in private with those who’ve come before us. Day-to-day contemporary rituals exist alongside ancient tradition and culture, side by side they collapsed time and space in Lxs Desaparecidxs. By calling the past into the present, Mother the Verb and Lxs Desaparecidxs activate ancestry and collective legacies to create tools for shared healing, empowerment, and a map for the future. 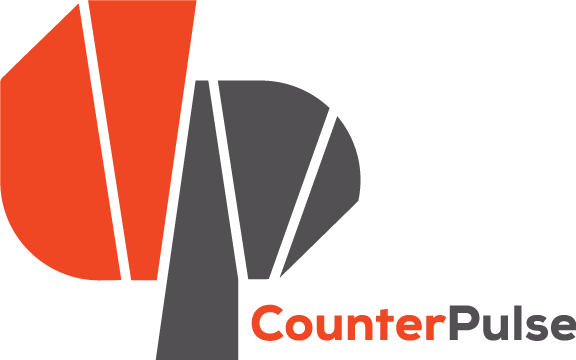 Zerena Diaz is the Communications & Development Fellow and Operations Manager at CounterPulse.